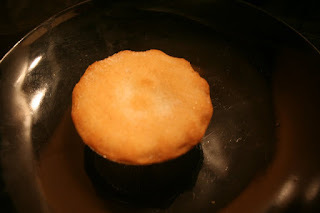 In comparison with the last one this was definitely more of the traditional mince pie in that it came in a pie shape in a little tinfoil pie case and was made of real pastry (real all butter pastry according to the packaging, more on this later). On that note before I go into scoring the packaging made me a little angry as I dont think you need to tell me that the mince pies are dusted with sugar if I can see through the little glass window that they are indeed dusted with sugar. Are Dunnes Stores assuming that most of their mince pie shoppers are imbeciles? Value(2.7): €2.49 for 6, cheaper than the non premium Superquinn ones so not bad. Someday when Im feeling very generous I may try their cheaper ones. Filling(1): There was plenty of filling and it was moist and sweet with no sign of suet. At least that was the way they tasted when hot. When cold however it tasted just plain weird. I couldnt really make it out, maybe it was the brandy (7% according to the ingredients) but if it was it tasted remarkably like the kind of very cheap booze that I used to drink when in college, you know the kind that would make you go blind if you had to much of it? Oh and when cold the raisins were also very very chewy which just seemed wrong. Strange that it could taste so completely different when cold than hot. I persevered though and finished it just to be sure. Pastry(2): Yay for the "all butter pastry", yet this was one of the last ingredients on the box so Im guessing there was something else that bound the pastry together. All in all the pastry wasnt the worst ever when cold. When warmish the pie just kind of collapsed on its own. I got the feeling that this mince pie might have been afraid I was going to load it down with cream. Now that Im talking about mince pies having feelings I should really give up. Packaging and design(1): Not a bad box at all, quite posh looking in comparison with the cheaper mince pies. Despite my groanings about the description on the box above it was nice to have a recipe on the box and a reminder of just how much lard I was eating by doing this survey today (surprisingly not a mad amount either - only .2g saturated fat per pie - another reason there couldnt be that much butter in there). It was also nice to know that these pies werent designed to last until 2020 and as a result wouldnt do bad things to my insides. Total: 6.7. Only eat these if you have a way of heating them and if you do be careful that they dont collapse under the strain of being heated. Not bad when heated but fairly weird tasting otherwise. Oddly a guy I work with tasted one and said it was the best mince pie he had eaten all year, then he did look at me fairly strangely when I brought mince pies in for afternoon tea and made a comment about it being far too early for mince pies.